We made it through the first week of the new year, this calls for pizza! Haha! Yes I am aware that many are trying to eat healthier in the new year and that’s why I decided to share a pizza that has spinach, hey it’s got some greens it has to be good for you right? Really thought this Spinach Artichoke Neapolitan Pizza has greens , artichokes, and is not your average heavy greasy pizza. The combo is a little heavier than some of my pizzas but still not greasy and you can go lighter on the spinach base if you want. Honestly though I’m sharing it for a couple reasons. I had planned on sharing it later this month but feeling under the weather the last couple weeks and things being busy for the holidays I didn’t get my other posts I wanted to share done. Since I took time off over the holidays I wanted to post today. Second because Friday is usually a pizza night for us and honestly if we weren’t going out with friends tonight we would probably be making pizzas, or if we weren’t up to it ordering sushi. Third if you follow me you know we do a family foodie date once a month. Last year we went to a different donut shop every month. The family loves donuts and not going to lie I found a love for them too last year and it was just fun. We would go out and get a bunch of donuts, try new things, and just talk about life. Our last one being last week we got a bunch of donuts and took a piece of this one and that one but with all the sweets I don’t think the girls or I even finished a whole donut, we were just sugared out. Crazy I know but hey it happens. So this year our theme is… PIZZA! Another family favorite we will be hitting up a different local pizza shop once a month. I wonder how this will affect how often we make pizza at home. My guess is we will still make pizza once or twice a month at home and I look forward to it since I (and my hubby) like playing with flavor combos. I also just had our new shirts made and can’t wait to share those. You may have seen our donut shirts I posted on Instagram last week, they were just so cute we love them. Mine said “Abs are great but have you tried donuts”, sorry couldn’t help it. Haha! I’m all about healthy balance and while we eat pretty healthy we have treats now and then and try to maintain a healthy balance of fueling out bodies to feel out best and living life and enjoying things we like. Last I know many are cutting out dairy and I want to share that you can still enjoy your delicious pizza without the dairy! 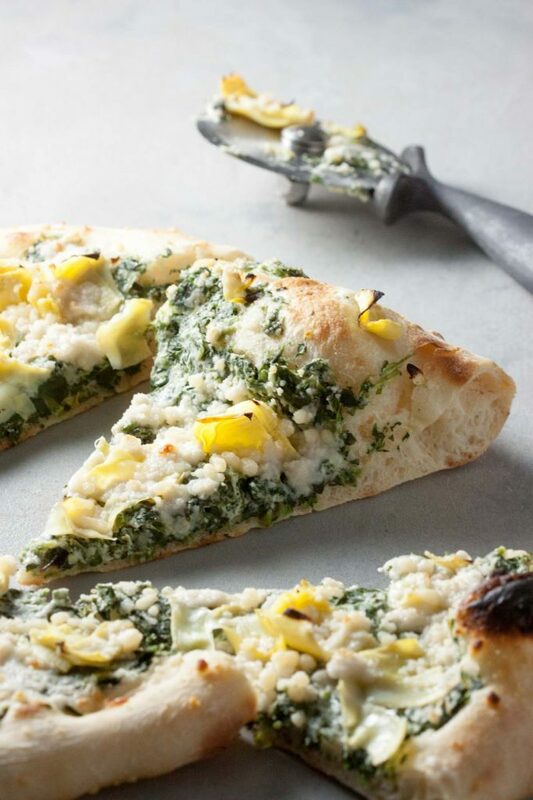 So this Spinach Artichoke Neapolitan Pizza, not sure what was thinking when I came up with this combo other than I must have been thinking about spinach artichoke dip? Yes this is still dairy free and vegan and oh so delicious! Again using my husband’s “famous” ok maybe only famous among our friends and family but it’s good Neapolitan Pizza Crust. Than making a creamy spinach cheese base using frozen spinach, roasted garlic (yes it has to be roasted it’s so good and isn’t the same as raw garlic), vegan cream cheese, and a little non dairy milk. Than topping that with chopped artichokes, shredded vegan mozzarella, and some sprinkle dairy free parmesan. So many flavors and it’s so good you will think you just dipped a fresh puffy chewy piece of bread in spinach artichoke dip and went to heaven. Just look at that crust! This is perfect for game day, if I was having a Super Bowl party or football party we would do a homemade pizza party and this would be a must. Even for a Stanley Cup party since that’s more our thing. This is also great for a Friday or Saturday night pizza night and if you are doing the 21 Day Dairy Free Challenge that So Delicious is doing later this month or new to dairy free or vegan eating I highly recommend trying one of my pizzas (there are many on the blog) and you will not miss the greasy cheese pizzas and will fall in love with pizza night again. I also have to say that Miyoko’s Fresh VeganMozz (no affiliation) is the best vegan mozzarella cheese I have found and the only one that melts on pizza. I don’t care for the taste plain or raw but on a pizza it’s my favorite by far for the creaminess and texture. *I make a 12-14″ pizza with our homemade crust. If you want a thinner crust you can probably go to 16″ or this would still probably work with the same amount of toppings if you are using another 16″ crust. Make Neapolitan Pizza Crust if using, you will have to make the dough 3 hours, 4 hours is best, ahead of time. It doesn’t take long to make you just have to let it rest and rise. Heat grill or oven, with pizza stone placed inside, to 550F if using my husband’s crust recipe otherwise heat per your pizza crust directions. Toss or roll your pizza dough and place on a piece of parchment paper on a non rimmed baking sheet. In a medium bowl smash peeled roasted garlic cloves with the back of a spoon. Add cream cheese, salt, and non dairy milk to the roasted garlic and stir to combine. Making sure the thawed spinach is squeezed and excess moisture is removed stir into the cream cheese mixture. Carefully spread mixture on your pizza crust leaving about a 1/2″ of crust around the edge. Sprinkle chopped artichokes, shredded mozzarella, and parmesan cheese over the top. Place pizza, keeping it on the parchment as it will easily slide on and off your pizza stone, onto the pizza stone. Check at 6 minutes, the crust should start to be golden brown and slightly blackened on the outer edges like a traditional Neapolitan pizza. It can take up to 8-10 minutes depending on the temperature of your grill/oven. If using your own crust bake per your crusts instructions. Remove pizza, sliding a baking sheet under the parchment paper. Let cool slightly before slicing. Enjoy! 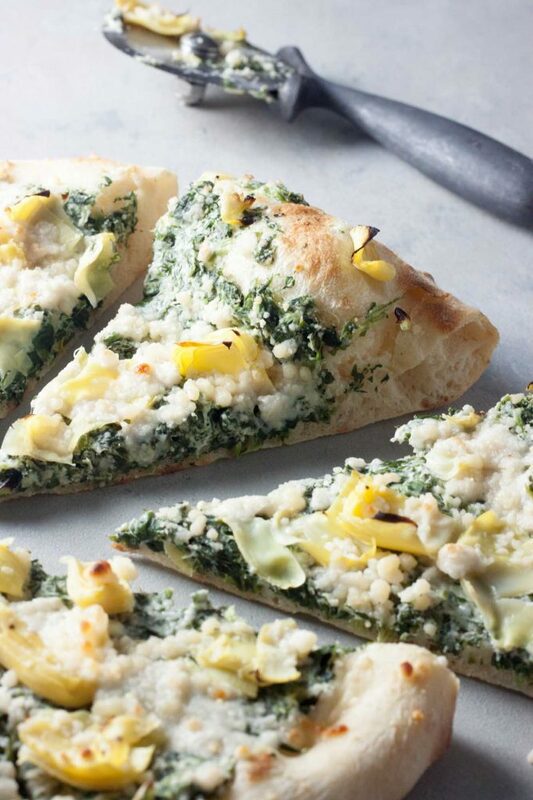 Forget take-out make this delicious dairy free (vegan) Spinach Artichoke Neapolitan Pizza! Thank you Deborah! My husband’s crust and dairy free cheese has been a serious game changer in our house! Anytime your in MN you let me know and you’ll have to come over for pizza and wine! I want to reach through the screen a grab a slice right now!!! I can’t believe this is vegan!! (Thank you!!!) It looks totally legit. I have only recently discovered Kite Hill and I love it! Gotta try this pizza! It’s so good I wish I could share a slice! There are a couple vegan cheeses now that are total game changers! Let me know what you think if you make it. Every Friday my guilt kicks in as i see your beautiful homemade pizza and i watch David toss in another frozen pizza, my excuse was always that I don’t eat dairy…but now I see, I’m just being lazy!! This looks great! Haha sorry but I can’t help but giggle. It’s so easy you just need to plan ahead a little for the crust. Anytime you’re in MN you let me know and we’ll have you over for pizza! 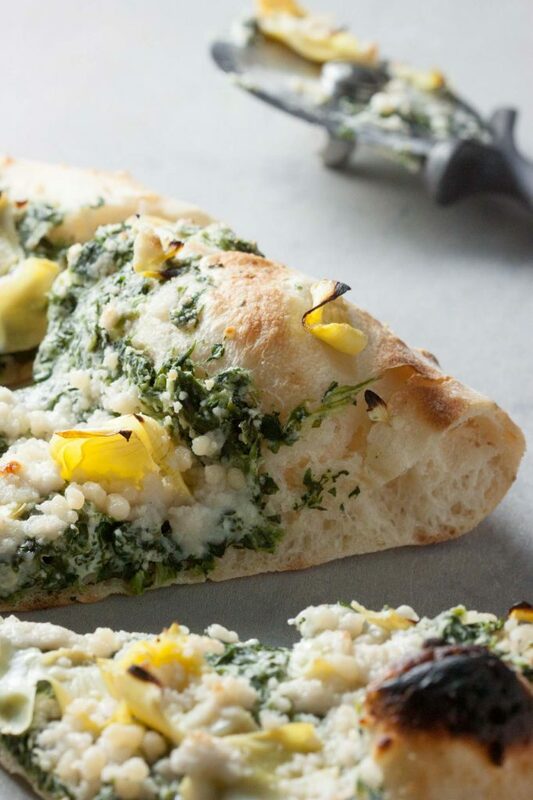 Omggggg I love spinach artichoke dip and I love pizza so this recipe NEEDS to happen in my life, haha. Happy Friday! It’s so good I know you will love it if you make it! Keep me posted if you do. I hope you had a great weekend! 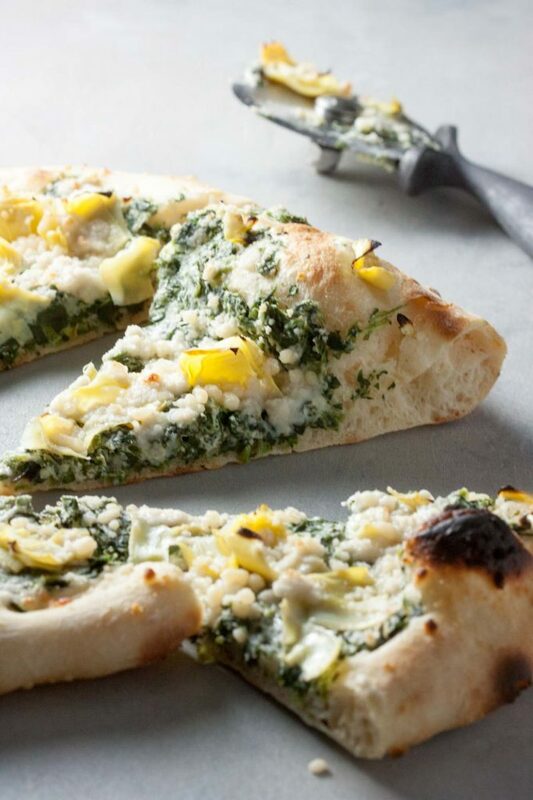 I instantly thought about spinach and artichoke dip when I saw this pizza! It is one of my favorite appetizers so I know I will fall in love with this too! One of my favorite parts is that it is dairy free! It’s so good and it’s an all in one dip! I know you’d love it if you tried it Meg! 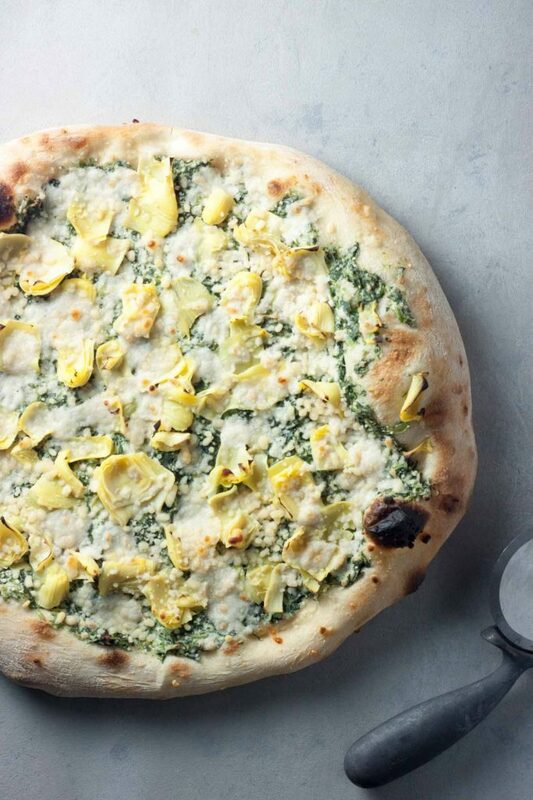 You are combining two of my favorite things – pizza and spinach and artichoke dip!! This looks perfect for a cozy Friday night in. It’s the best of both worlds! It’s perfect for any night but especially a Friday night in. Making it through the first week definitely calls for pizza! This looks so delicious, you can’t even tell it’s dairy free! Thank you and I couldn’t agree more Jessica! You really can’t it’s so creamy and good! This looks INCREDIBLE. And your pictures are SO gorgeous. I want pizza right now! Thank you Angela, it’s so good! I’ve been working on my photography and I love that I’m finally able to capture how good I think the food tastes. I love this pizza! It reminds me of a pizzaria named Artichoke in NYC. They made a wonderful artichoke pie, similar to this one! Pinning! I’m giving this recipe a try! Ilka recently posted…Treasure Coast Marathon Training Log – Happy New Year! Sounds like I have to add that place to my list! We had pizza in NYC but it was so cheesy and my tummy was not happy that I gave in and had to try it. Let me know if you try it! This looks absolutely delicious! Definitely going to try this one. Thank you, let me know what you think if you do!